Maverick Foundation scholarship recipients helped organize the 104th Annual Independence Day Parade in Travis. Despite the rainy weather, the parade marched on thanks to the hard work and efforts of our young volunteers. 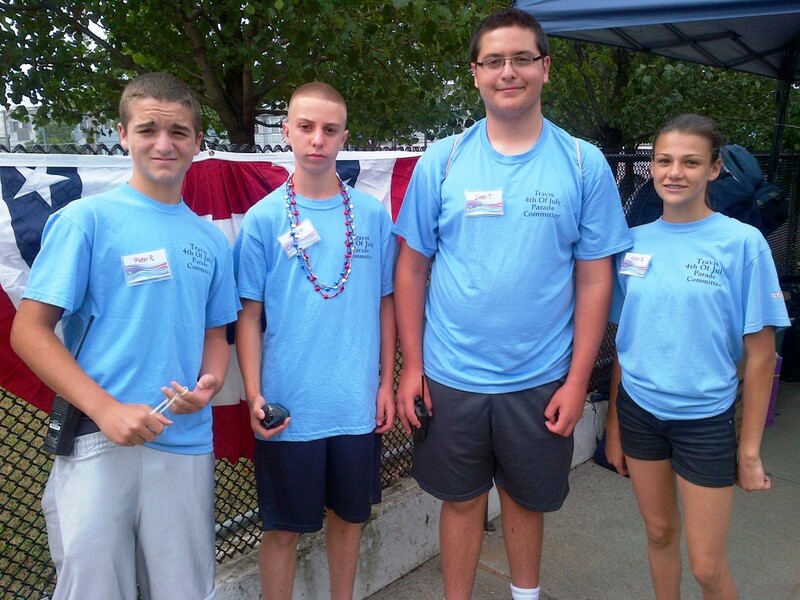 In the picture below, from left to right, Peter Rotondo, Frank Pizzella, Santo Tiralosi, and Kristen Blanchard were instrumental in setting up the line of march and preparing the Reviewing Stand for the ceremony as well as breaking down the parade. Thank you Peter, Frank, Santo, and Kristen! The Maverick Foundation was honored and proud to have Congressman Michael Grimm visit our 13th Annual Lt. Joe Gullickson Memorial Picnic. He spent a good amount of time talking with guests and scholarship recipients. 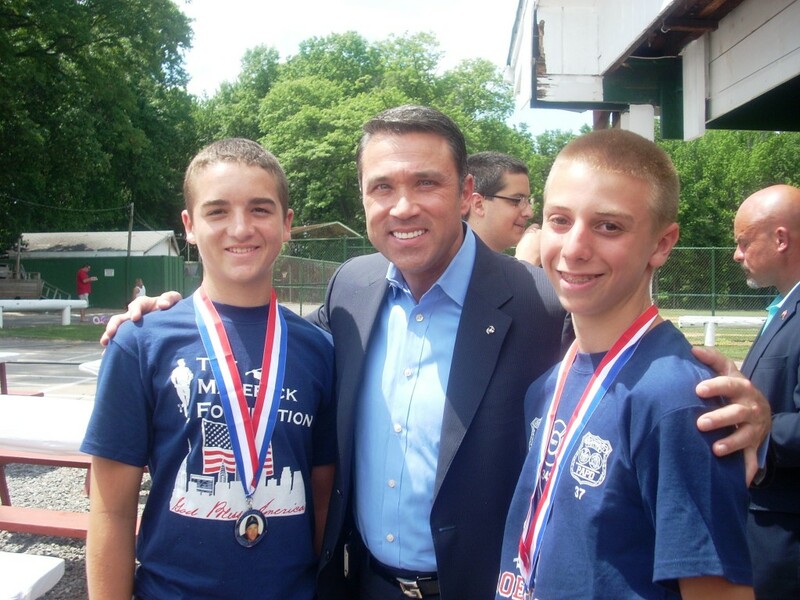 In the below picture, Congressman Grimm is with Peter Rotondo on the left and Frank Pizzella on the right. I just wanted to THANK YOU for your support of The Maverick Foundation and helping make the 13th Annual Lt. Joe Gullickson Memorial Picnic a very memorable and successful event this past Saturday! Whether it was attending the picnic, selling raffles “behind the scenes,” making a donation, volunteering for the event, donating a prize to our raffle table, or just helping get the word out, I appreciate it very much! We had a great day for Joe! Special appreciation to . . . The FDNY Honor Guard including Chief Kevin Woods, Chief Jim Boylan, FF Zeke Quin, FF Andrew Francis, FF Charlie Banardi, FF Sayed, FF Jay Mahoney, and for Captain Tom Gardner for arrangement, equipment and the logistics. Kevin & Eileen Christie for setting up and managing the raffle table. Ryan & Christina O’Shea for their huge early morning assist with set-up. John & Denise Marino for the donating the balloon arrangements. Ted Farinella for his huge support at the raffle table with the play tickets and Yankee tickets. JetBlue, especially Richard Smyth, for their two pairs of “Fly Anywhere” Tickets that are a huge draw at our raffle table. Jerry Scully for singing “God Bless America” each and every year. The FDNY Red Hook Raiders who come each and every year including Ed Kearon, Jack Oehm, Tony Catapano, Eddie Davis, Andy Singleton and Tom Giordano. Brooke Dubinski and Katie Wilkinson of Turner for requesting and managing corporate contributions. Those who traveled for some distance including Connecticut, Westchester, Long Island, New Jersey, Brooklyn, Manhattan, and Queens to get to the Picnic. We had a record number of people . . . 283 . . . And we are growing each year. Some key achievements for the foundation are that we have issued $229,000 in scholarships, presented 211 Good Citizen Awards over 11 years, and our Scholarship Recipients have performed collectively over 5,000 hours of public service. We are now annually averaging about 1,000 hours of public service per year with each recipient averaging 100 hours per year. We now have four volunteers with Meals on Wheels alone. In 2002, we had one scholarship recipient. Last Saturday, I introduced 8 current recipients, 3 new recipients, and 4 past recipients who have graduated from our scholarship program. Thanks again for your steadfast support and dedication that allows us to continue with our mission! The Maverick Foundation is proud to announce that Frank Pizzella has been awarded “The Terry Sweeney Memorial Scholarship” for 2014. Frank is a member of the National Junior Honor Society and is a graduate of Saint Rita’s school where he was involved with many volunteer activities including serving as an ambassador for the school to greet and welcome new students and their parents. 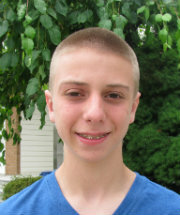 Frank has been accepted to the Saint Peter’s High School Honors Program. He currently aspires to be an FBI agent. The Maverick Foundation is proud to announce that Peter Rotondo has been awarded “The Bill Hodge Memorial Scholarship” for 2014. Peter is a member of the National Junior Honor Society and is a graduate of Saint Rita’s school where he was involved with many volunteer activities including serving as an altar server and as a volunteer with Project Homefront packing supplies for our soldiers. 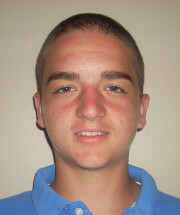 Frank has been accepted to the Saint Peter’s High School Scholars Program. He currently aspires to have a career in the Army.